2019 Apple Festivals in Vermont - Where, When and More to Find an Apple Festival Near You! Looking for a apple festival in Vermont in 2019? (just scroll down the page)There is no other listing as complete and current as this list, just updated! All the apple festivals in Vermont we can find are listed on this page! If you love strawberries, look for a festival near you below! And I'm always looking for more apple festivals! Please write me, if you know of any to add! I update the dates as soon as the festivals publish their information, but you can always click on the links (usually the name of the festival) to see the current information on the festival's own website. Belmont Cider Days - one weekend in October, Saturday 10am -4pm and Sunday 12-4pm. Belmont Green, Mt. Holly, VT.
Every year the townspeople gather on the village green for two days of apple cider pressing, apple pie eating, and local artisans and crafters selling there wares. There's cheese sampling by Crowley Cheese, a local cheese company that has been making cheese in this town for over 100 years (Still doing it all by hand). Local service organizations sponsor tables for fun raising. The first day of the festival (Saturday) starts with a pancake breakfast at the Mt. Holly Grange and the Cider Days begins promptly afterwards. After a day on the green a Public Dinner is held from 5-7pm at the Odd Fellows Hall in Belmont. (This was an old toy factory at the turn of the century which made sleds and wagons.) Sunday's Cider Days starts at 11 am and goes to 4pm culminating with a last minute cider pressing. Burlington, WV. Free admission to the two-day event with live country, bluegrass, and southern gospel music performed on-stage See Burlington's Famous Apple Butter being made the old-fashioned-way in open-air kettles! Also, a 3-acre flea market; tents filled with handmade items. Loads of food, such as apple specialties, country ham sandwiches, funnel cakes, and more! Heritage quilts on display, a parade, music, games, pony rides and fun for the whole family! Dummerston Apple Pie Festival - October 12, 2008 from 9 am until sold out. Dummerston Center. Phone: (802) 254-9158. A full 1,500 apple pies are made by many church members and friends. 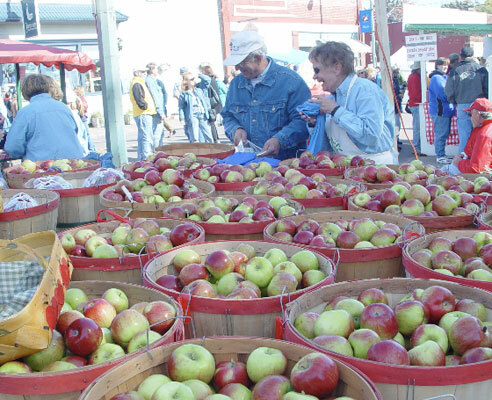 Vermont Apple Festival & Craft Show - a Saturday in October, from 10 am to 5 pm and Sunday, from 10 am to 4 pm. Riverside Middle School, Springfield, Vermont. Event dates: y, Admission is $3 for adults, $2 for seniors and $1 for children 6-12, under 5 free. On Sunday, there's the annual Apple Pie contest! As always, there will be two categories for Best Pies, Traditional & Non-Traditional. Pies need to be in by 10:30 am on Sunday and the Contest will take place at Noon! See the RULES link at the top of the page for our Apple Pie contest! Directions: FROM I-91 - Take Exit 7 and follow Route 11 West. The Apple Festival will be on your right-hand side just after McDonalds. Wellwood Orchards is the Official Orchard of the Vermont Apple Festival.